Somehow I had lost my bus ticket I bought yesterday. I went back to the ticket office and even though the agent didn’t speak the same language, he seemed to understand that I had lost my ticket and replaced it at no cost or fuss… Turkish hospitality at its best. 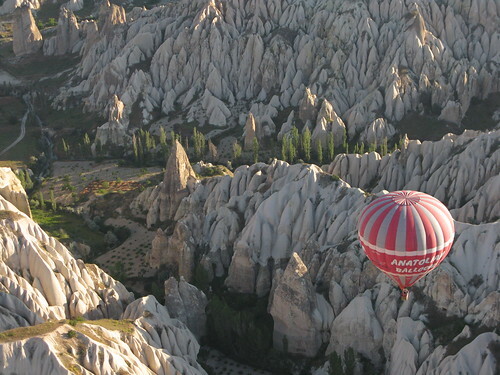 Riding into Cappadocia is a site to behold. Whitewashed stone cliffs, blended with hues of red and lime, and remnants of a millennia old volcano eruption. You can’t help but feel like you’re being transported in time or perhaps like you’re in an episode of the Flintstones and were driving into Bedrock. 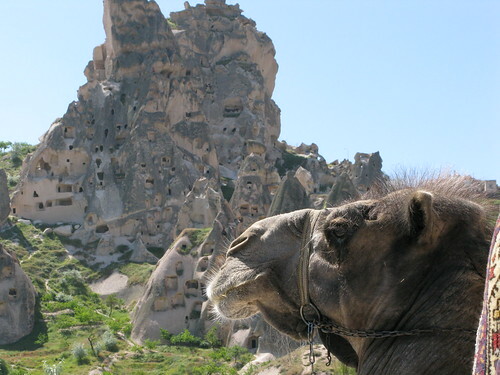 As you drive into the town and eventually through the Goreme Open Air Museum, you can just imagine the church processions that must have engulfed the region. There’s no shortage of places to stay, but you gotta take the chance to crash in a cave. You might think you won’t be able to rough it, but consider that I stayed in a cave fully equipped with a TV, Free Wi-Fi and a Jacuzzi! You just might be able to hack it… in comparison to every backpacker haunt I’ve stayed in before, and even to many of the hotels I’ve stayed in while backpacking, the cave was the height of luxury. And I was in heaven every morning with the the breakfast spread – imagine plate loads of dried figs, apricots, mulberries, and dates, alongside heaps of yogurt, cherries, and various cheeses. You can always opt for a ‘western’ breakfast of eggs – but the traditional breakfast is way better. Makes you feel like you’re a king from some old Ottoman tale! I really hope I get to go again! the next time i go, it will definitely be a more beaches and lounging kind of trip! Great picture! I went about 2 years ago but didn’t take pics. Regret it now! You should visit the beaches if you go again – i like them better than any in Europe.